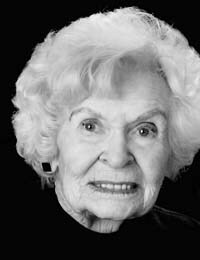 Gail Stiles Freund, 95, died on March 28, 2012, at the River Ridge Care and Rehab Center in Twin Falls. She was born July 30, 1916, in Pasadena, Calif., the daughter of Joseph and Marie Stiles. She grew up in Southern California and married Robert Freund in Santa Barbara in 1950. In the late 1970s, Gail moved to Idaho to be with her daughter and family. She started the River Run Gallery and custom framing shop with her son, Robbie, and daughter, Lynn in the early 1980s. She enjoyed working and sharing her expertise with customers and friends and built a successful business. She also taught piano for many years. She was a member of the Ketchum-Sun Valley Art Association and an avid supporter of the arts in the Wood River Valley. She will be remembered for her impeccable style and poise. Besides her love for art, her special interests included music, knitting and traveling in the U.S. and abroad after retirement. Gail loved dancing to big bands and ballroom dancing, winning competitions in her late teens and early 20s. Gail had a love of family and was always supportive of her children, grandchildren and great-grandchildren, who include her daughter, Lynn (Gary) Hino of Ketchum; son, Robbie (Carole) Freund of Hailey; grandchildren, Aara Zwerfel of Eugene, Ore., Allie and Brendan Freund of Hailey and Rain (David) McDonald; and great-grandchildren Gavin, Makena and Savanna of Hailey. She was preceded in death by her husband, Robert, parents and brothers Easley and Jack Stiles. She will be remembered in private memorial services by her immediate family. Cremation was under the care of Wood River Chapel, Hailey, Idaho.